The laser light is violet and also features a low positioning light. It works at a wavelength of 445 nm. The power of the laser is 2.5 W but smaller powers can be adjusted using the software used. The acrylic boards that support the engines did not have screw holes made correctly since when we assembled it we realized that the motor was not fixed since the screw holes were not close enough and there was slack. To solve this problem the holes of the boards were enlarged in the desired direction and to prevent the screw from moving once the machine was installed nuts with spikes were inserted and inserted into the acrylic board in the proper position. 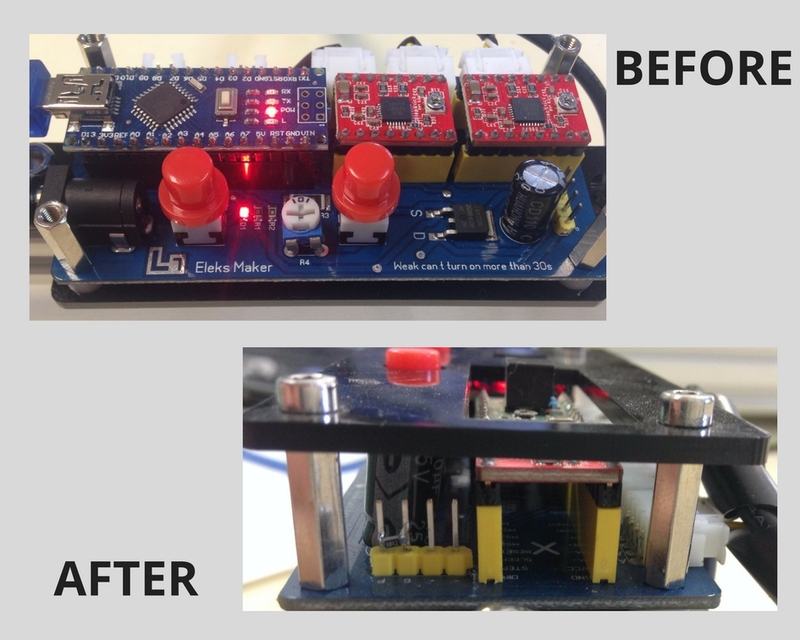 After the first tests we saw that the user did not completely control the laser module and sometimes it was turned on when it did not or did not respond to the ON-OFF buttons of the software. To solve this problem the circuit of the controller board was analyzed and it was seen that the transistor door was not correctly connected to ground. Therefore, it was sometimes floating and the user lost control of the laser. To solve this, a 6.12 Ω resistor (6R12) was inserted between the door and the ground.